The TABU school center in Bonn Tannenbusch has a grammar school with a music and a sports branch, a secondary modern school and an elementary school on its grounds. Here, two computer clubs have opened their doors in summer 2009 – one addressing 5th-graders of the secondary modern school and 4th-graders of the elementary school in a joint club, the other one being for those 6th-graders of the grammar school who are not enrolled in the music or sports programme of their school. Project topics in both clubs are closely linked to everyday life in the intercultural neighborhood Tannenbusch, aiming not only to address problems but also to put a focus on positive developments and strengths of the diverse local setting, and support these. Claw arm – 6th grade students design their own claw arms in small groups using the 3D Flash program. 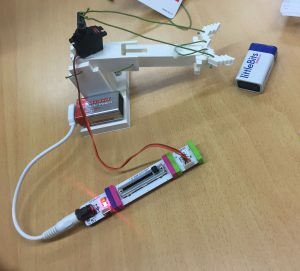 The goal was to bring the designed models to life with the help of LittleBits and ordinary objects. 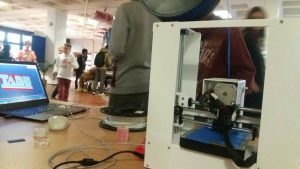 3D printing in art class – a 7th grade class entered in printing techniques this year. After tying lino-cut print we introduced a 3D modelling program to them and they created their own skulptures in groups. The creations where them printed with a portable 3D printer. Computer games und apps – Club participants aim to program either a functional game or app for a Smartphone. Little Bits – playfulexploration of Making with the Little Bits kits. audio drama – writing stories, recording them and edid the audio drama with a special programm. Programming with Skratch – Club participants explore this programming environment and write little games of their own choice. Presentations – Club participants make presentations with Open Office Impress and learn basic knowledge about this program. Subsequently, the presentations are shown and discussed in the group. Open Day – Many visitors came to see the club and its work. Students gave their presentations, and visitors were able to print their own key ring pendant with the school’s logo. Everything’s a game – Club participants design and program their own board game using Scratch. 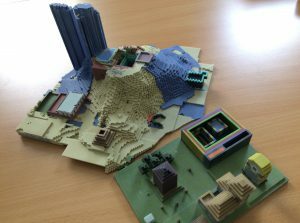 Minecraft – Children build a threedimensional world and print their buildings with the 3D-printer. Presentations – Topics from children’s school lessons were prepared for presentation with the help of the computer; and children gave little talks on their chosen topics. Tourism Map Bonn Tannenbusch – Children explored their neighborhood as a tourist place and presented places of interest with informations and directions in an interactive neighborhood map. Music Video – Children interpreted and recorded popular songs. Mangas – Inspiriert from a popular Manga-Exhibition in Bonn, children sketched their own Manga characters and animated these with the help of the visual programming environment Scratch. Neighborhood Reporter – Club participants explored their neighborhood and reported on local topics of their choice in writing and photograph. Club Homepage – Children and adults in the computerclub developed and designed a webpage for their club. Foto Project – Children created picture stories and animations from images they had created during a school trip. Game Project – Children designed a collection of smaller individual board games in Scratch, which were then assembled to one large game.